Given the official separation of church and state in the United States, it might seem perfectly intuitive for a politician to attend a conference on freedom from religion. Not necessarily so for a substantial number of Americans. One politician’s plan to welcome the Freedom from Religion Foundation in her state next month might jeopardize the future of her political career, say academics. The indignation her speech will likely stir up among religionists further reflects the preoccupation Americans have with the religious beliefs of their leaders. The Freedom from Religion Foundation conference, an annual event comprised largely of atheists as well as some secular and theistic humanists, will stand out in particular this year because it will include a speech by the highest-ranking politician yet—Wisconsin Lt. Governor Barbara Stanton. Initially the foundation expressed surprise at Stanton’s acceptance of their invitation to speak: “Normally, we get the cold shoulder by public officials”, said foundation co-president Annie Laurie Gaylor. But Stanton’s decision to speak at the conference might prove off-putting to potential voters in future elections. Despite constitutional provisions barring state religion, and despite the fact that there is no religious test for office with the aim of weeding out atheists, since the 1980s U.S. politicians have experienced increasing pressure by the public to demonstrate their religious “qualifications”, explains Pam Selman of The Badger Herald, quoting political scientist Howard Schweber. Pelman also reports Schweber as saying, “American public officials sometimes begin political downfall when they associate as non-religious or atheist”. Meanwhile, political scientist Dietram A. Scheufele points out that “[t]he central role religion has played in recent years is dominating the discussions around the candidates”. White Christians do not appear to be growing any less adamant about the religious foundation of their nation and the importance of religious faith in their political leaders. Case in point: the recent, highly sensationalized media discourse over whether or not Barack Obama is really a Christian—a discourse which need not even be happening in the first place if the president of the United States is supposed to be leaving his religion at the door when he walks into work each day. A novel idea. Her father was a patriot—not for pumping some chauvinistic, fundamentalist Christian worldview into secular politics while waving a flag, quoting scripture, wiping away tears, clapping his hand to his heart, and echoing tired platitudes in some deceptively saccharine display of emotion; rather, he was a patriot for defending democracy against potential theocratic coups d’états which violate the venerable principles of Enlightenment philosophy enshrined in the very constitution which religious zealots repeatedly cite to advance their own agenda. An ironic twist. But why have Americans grown so obsessively religious—almost to the point of being schizophrenically paranoid about other religions (even when these are uncannily similar to their own)—and why have they grown so hostile towards the fundamental concept of separation of church and state? Perhaps it has to do with education. The average American is shockingly ignorant about the way their own government operates (to say nothing of the way other countries are run) and about the guarantees outlined in their own constitution, let alone the historical and philosophical context of and motivations behind these; exacerbating this is their intellectual torpor and ineptitude in critical reasoning. Perhaps it has also to do with insecurity. As the United States gradually becomes less white and less Christian, and as moderate Republicans begin to view the institution of marriage more as a loving commitment than as a breeding program, the ever-shrinking white Christian male bourgeoisie will doggedly re-assert with inexorable pride their white heritage, Christian faith, and maleness over other groups who dare take an equal slice of the American pie. And they have enough money to do so. Of course, these are just hypotheses, but we must begin somewhere, mustn’t we? We invite our ministers ordained online to share their thoughts about Lt. 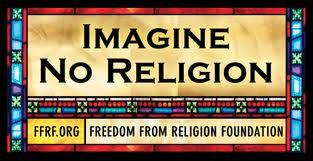 Governor Lawton’s proposed speech at the Freedom from Religion Foundation conference. Why is it suddenly such a big deal here and now in the 21st century for Lawton to be welcoming a convention of activists who defend a concept on which the country was founded in 1787? Do you think that a political leader’s religious beliefs are integral to his or her political work, or do you find such beliefs irrelevant so long as he or she does a good job? Read more about atheism and humanism by visiting the ULC Monastery Guide to Divinity.